You are here: Home / Tarot Card Readings / What is Interesting about the Wanderer Tarot Card Meaning to Know? 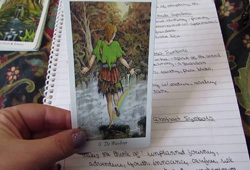 What do you know about “The Wanderer Tarot card meaning“? The Wanderer (0) signifies the ending of an on journey and the start of a new one. It shows that you are ready to make the leap into the unknown. Rather than worrying, you must accept the cycle and move forward with positivity. All required is faith – do you have enough faith to walk onto the rainbow bridge leading forward? The Wanderer card (Major Arcana) belongs to the Wildwood Tarot deck, a complete re-conception and redesign of the popular Greenwood deck. 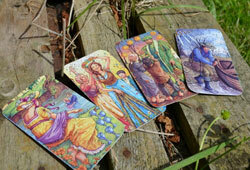 What does it mean in a Tarot reading? The Wanderer relates to being open to new experiences without involving where they may ultimately lead. No matter what adventures come your way, your life will be filled with enthusiasm and anticipation. Be strong and confident to start fulfilling your dreams and goals. For those have no clue, this card here is the Fool card in traditional decks. 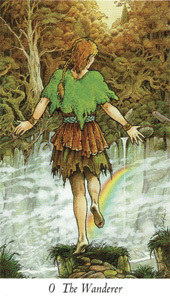 Well, the Wanderer Tarot card (placed upright) can mean – a new beginning, a new belief, a new path, faith, a higher than usual intuition, letting go of worry and fear, feeling happy, joyful, and carefree, heading into the unknown, not knowing what to expect, as well as being in the right place at the right time. 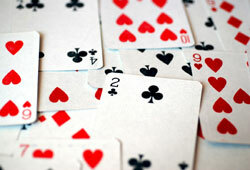 However, once reversing the card, the meaning will change entirely – losing faith, feeling fearful, and stagnation. Looking at the card, here you see a young girl walking out towards the edge of the cliff. Her arms are spreading purposefully as if she is going to embrace everything in front of her, even knowing that the path ahead her is partially obscured by clouds. There is a waterfall on the other side and a shimmery rainbow bridge leading to it; if you look closely, you’ll also see the rocky terrain far below. Across the way is an ancient forest fill with trees in hues of green, yellow, and brown. Interestingly, some gnarled roots have faces – they are the woods’ watchers. What is the essence of the Wanderer card? A fall would be obvious, but somehow you know she’s not going to fall. The girl’s faith, optimism, and willingness to seize any opportunity will lead her safely to the other side. It is about taking a leap of faith and being open to go wherever the moment takes you. Representing new beginnings, new experiences, new belief, faith in the future, improvisation, and freedom, the Wanderer also indicates to be childlike and to have an open mind. This card does not offer a specific right or wrong answer; instead, it requires you to follow your instinct to navigate yourself through life. Additionally, pure and utter potential, the Wanderer card corresponds to a new situation that you are feeling very excited about. This is a lucky card. Once it shows up for you, meaning you are about to be in the right place at the right time. Shortly, “the Wanderer Tarot card meaning” wants you to immersing yourself fully in the life journey rather than focusing too much on the destination. Thinking simple can open up a whole new world of possibilities that you definitely don’t want to miss. Most significantly, give yourself time to take that leap of faith.